We eat lots of different foods in my house. Savory, sweet, Indian, French, Asian, vegetarian or meat, at one time or another we’ve made it. If there’s one common bond among the vastly varied preferences, it’s that everyone in my home has a sweet tooth. I’m happy to oblige my family’s confectionary cravings, so today I made a peach and cinnamon cake. 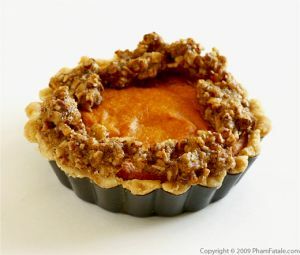 I flavored it with ultra ripe, sweet peaches and fragrant cinnamon and a layer of almond streusel crumb mixture. 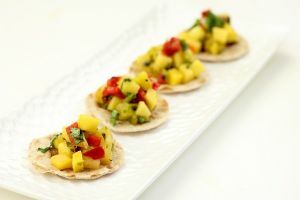 This sweet snack is not only good for tea time but is a perfect ending to a school lunch. In fact, I packed a square of the cake along with a small pouch of milk for my little munchkin. Ready-packed 8.25-ounce fresh milk pouches are available at Trader Joe's and Whole Foods, so it's very convenient to feed your children a balanced meal, even when they're on the go. If the peaches aren't ripe enough and the skin doesn't separate easily, here's a neat method to peel them. Make a delicate criss-cross cut at the bottom of each peach using a sharp hook-like paring knife (don't make a deep cut so as not to bruise the fruit). Fill a saucepan with cold water and bring to a boil. Place the peaches in the water and wait for at least 30 seconds. Remove the peaches quickly (I use a large strainer), then transfer to an ice cold bath to stop the cooking process. The skin of the peaches will come right off. Cut the peaches in half. Remove the pit and cut the flesh into chunky pieces, gathering as much juice as possible. 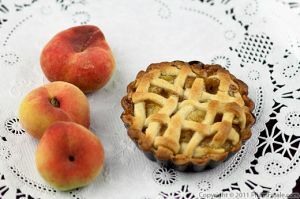 Sprinkle with cinnamon, rum extract (if used) and 1 tablespoon granulated sugar (depending on how sweet the peaches are). Toss well. Set aside. Grease (I used 1 tablespoon of butter) and slightly flour a non-stick (8-inch) square cake pan. Beat the eggs in a mixing bowl with 3/4 cup of granulated sugar until they're pale yellow; the texture of the eggs will be thicker. Add the vanilla extract. In a separate bowl, sift the flour, baking powder and salt. 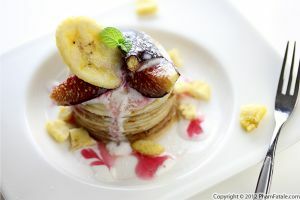 Combine the egg mixture and the dry ingredients, alternating with milk so the batter is smooth. Add the soft butter and mix until the cake batter is formed. Finish with the remaining sugar. Pour in 1/3 of the cake batter. Spread a layer of cinnamon-favored peaches. Sprinkle with the cold streusel crumb mixture (if used) and cover with the rest of the cake batter. Bake for 10 minutes at 400°F; lower the temperature to 375°F and bake for another 35-40 minutes until the top is slightly golden. 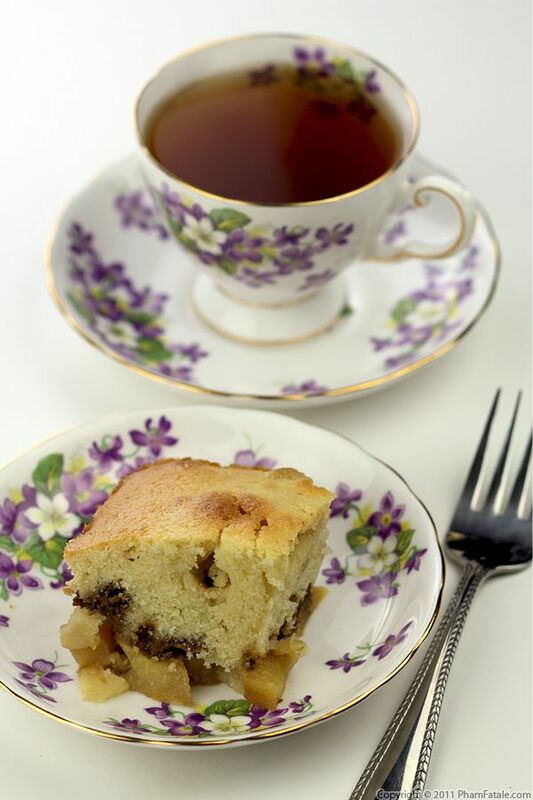 A skewer or a toothpick inserted into the coffee cake should come out clean. Remove from the oven and allow to cool completely. Serve warm or at room temperature with a hot cup of tea. You could replace the peaches with any fruit you have on hand. Sifting the dry ingredients helps to get rid of lumps of flour and also to aerate the mixture when liquid is added. It's very important for all of your baking so you get a moist result. 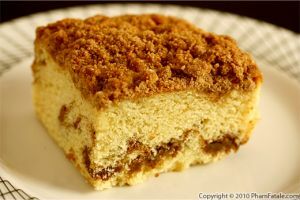 You could also replace the streusel crumb mixture with dried fruit such as dried peaches, raisins or even candied ginger. For an adult version, you could drizzle rum over the peaches prior to pouring the cake batter. I usually get a bag of cinnamon sticks at a more reasonable price at the Indian market, compared to the regular local chain stores. I grated it using a Microplane. You can use ready-made ground cinnamon but I think the flavor is more intense when freshly grated. 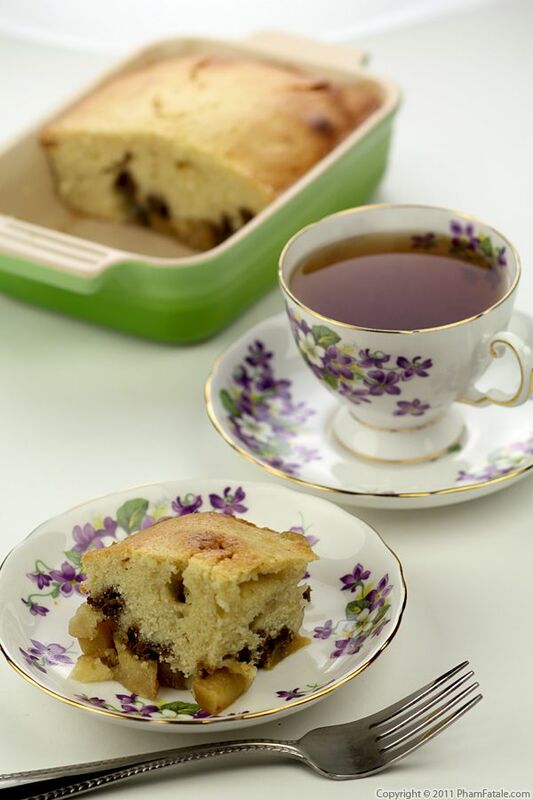 You could also serve the cake as individual portions baked in a muffin tin. 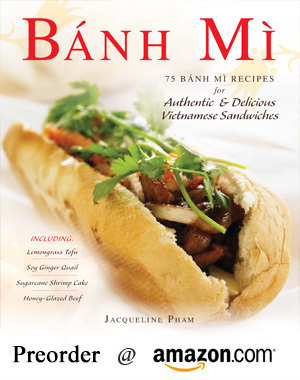 Published By: Jacqueline Pham on August 19, 2011.